I write this blog post as I sit on the plane returning from my annual business trip to Tahiti and her Islands. I am reminded how important it is that I continue to visit at least once a year. Although a small and quiet destination, it is unbelievable how many updates continually take place. Changes in resort ownership, property management companies, managers, tours, renovations, and more! For this post, I just wanted to share all the exciting news about the new Conrad Bora Bora Nui Resort and Spa. The resort was previously the Hilton Bora Bora Nui Resort and Spa and has been closed for some time to completely renovate and redo the whole property before they relaunched as a new and upgraded Conrad resort. Upon arrival, we were dropped off in what looked like a very chaotic shipping or warehouse dock. At first, I was completely shocked by the state of the resort, expecting it to be much more complete. However, we were assured things are moving forward as planned. There are currently about 300 crew working 24-hours a day to get it complete and ready to accept guests in early 2018. As we toured the resort, the initial shock of the construction zone slowly disappeared, and excitement and an image of the finished property were coming together in my mind. Conrad’s goal is a more modern design with unique and entertaining features coupled with events around the resort and excursions to draw in the Polynesian history and culture. The updated bungalows were gorgeous. A wall has been removed from the original struct ures giving them an open concept; very bright and airy. In front of the bed are sliding glass doors that grant a magnificent view of the beautiful lagoon. Décor is a bit more modern with black furniture, a luxurious round bathtub, and an abundant use of beautiful wood that keeps more of a Polynesian feel. For the technology lover, the rooms are state-of-the-art. I loved the built-in Bluetooth speaker system that allows you to control three different sound zones, including the built-in speakers outside on your deck. Televisions have input plugs that allow you to hook up your electronic devices. This is great for viewing and editing pictures from your trip. There’s also a handy switch at your bedside to control all lights and the ceiling fan from one spot (I hate searching a 1,000-square foot bungalow for light switches!). Conrad is also building two new beach bungalows with private plunge pools and adding similar pools to many of the existing overwater cottages. In the end, every bungalow will have been completely renovated from top to bottom. Million dollar dinner – A dinner service at the top of the Motu with a million dollar view! Rumours of an ice cream trolley strolling the property, and much more! Overall, on the surface, it appears there is still much work to be done before they begin accepting guests, but once completed, I think the resort is going to be an incredible hit! I look forward to returning to experience the food and service as well as all the great amenities and features I learned of on this tour. Currently, I have a soft opening launch promotion of 40% off the regular rates for a stays from January 25, 2017 until May 31 2017 . I also have some combination promotions available as well, for when you stay at both the Hilton Moorea and the Conrad Bora Bora Nui. 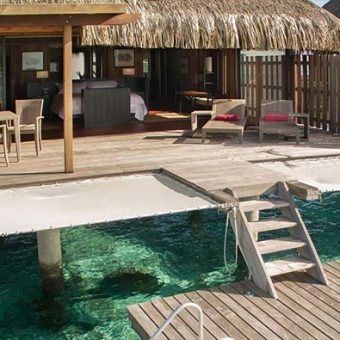 Contact me to plan your visit to the newest resort in Bora Bora!